SGDQ 2018 kicked off last week, hosting speedruns and raising money for Doctors Without Borders. Two of the best runs of the marathon happened nearly back to back last night. The first is a 100% run of the tricky boss-battler Cuphead. Piotr Delgado “The Mexican Runner” Kusielczuk completed the game, finishing all missions and defeating all bosses. Kusielczuk’s charming personality and active couch commentary crew made for a run that not only showed off the runner but helped explain key tricks. The most important trick was the “weapon swap” glitch that allows players to quickly change their weapons back and forth. Swapping back and forth rapidly fires more projectiles, reducing the length of boss fights. Kusielczuk was able to take down bosses easily, sometimes skipping entire phases of boss fights. The run also featured some silly cartoon voice acting by Kusielczuk and his crews. It’s as charming as it is impressive. Shortly after this was a race of the precision platformer Celeste. The game’s top two runners, TGH and YoshiPro, competed to see who could finish the game first. TGH won out, finishing 51 seconds before YoshiPro. Their runs took a little over half an hour and made use of techniques like the “hyper jump,” a special jump where runners dash into the ground before jumping. This launches them forward at great speeds, helping them gain extra distance for skipping certain hazards. Celeste is one of the year’s best games, and watching its difficult stages get blown wide open was amazing. 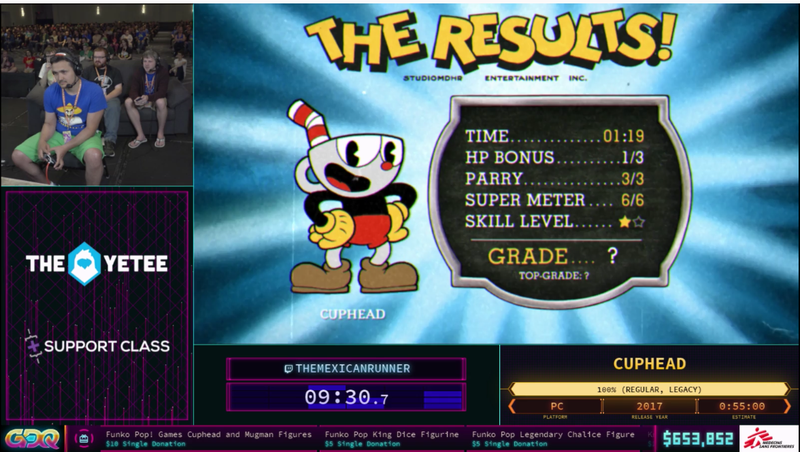 You can watch the Cuphead run above at timestamp 24:30:26 and check out the Celeste run at 24:32:32. They’re astounding examples of what happens when you devote yourself to beating difficult challenges.